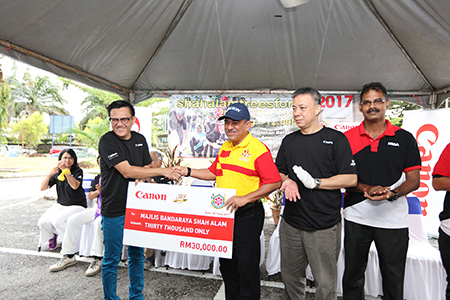 SHAH ALAM, SELANGOR, 20 MAY 2017 – As Canon Marketing (Malaysia) celebrates its 30th year anniversary this year, the global leader in imaging products and solutions is giving back to Malaysians who have supported them throughout through its 'One Canon One Tree' program by planting 3,000 trees in Bukit Jelutong, Shah Alam. 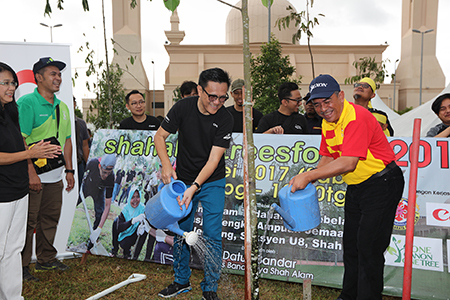 Partnering with Shah Alam City Council (Majlis Bandaraya Shah Alam, MBSA), the inititiave saw an estimated 600 participants gathered to plant 3,000 trees in the vicinity of Masjid Tengku Ampuan Jemaah at Seksyen U8, Bukit Jelutong, in the hopes of increasing environmental benefit and improve on greenery landscape in the city of Shah Alam. 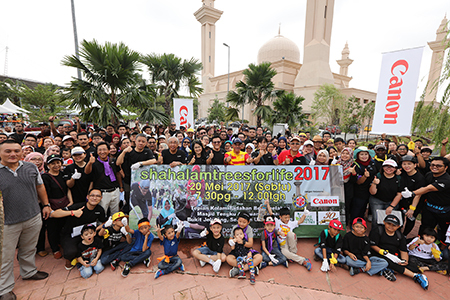 President and Chief Executive Officer of Canon Marketing (Malaysia), Andrew Koh, said that the 'One Canon One Tree' programme and the year-long 'Canon Gives Back' campaign is an effort by Canon to create a sustainable future by planting the seeds of tomorrow, today. "At Canon, we believe that technological innovation and improvement are not exclusive to just our products but also extends in our environmental awareness and social consciousness. We believe that the balance to harmonise environmental commitment and business interests is essential to sustain prosperity for future generations," he explained. "The first photos were printed on paper, and they have given Malaysians memories, and that Canon is grateful for always having been Malaysia's partner in capturing moments and continuing legacies," he said. With the support of Shah Alam City Council and together with its business partners and Canon group of companies - Canon Opto Malaysia, Canon Machinery Malaysia and Canon Mailcom Malaysia, the 'One Canon One Tree' initiative builds upon Canon's continuous commitment to preserve and sustain nature, ensuring many more generations of memories to be made. 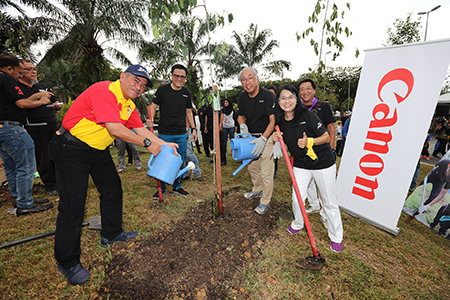 While this is not the first time Canon Marketing (Malaysia) has organised such an activity, the company is breaking its own record of tree planting with 3,000 trees this year here at Bukit Jelutong. In 2008, the company planted 2,500 trees in Kota Damansara, and 1,000 trees at Setia Alam last year. Harmony transcends generations, and Canon is committed to pass on its values to the young. "Wherever Canon is, we aspire to leave an impact to the community around us through our philosophy of 'Kyosei' - this is how we have maintained our relevance and ability to evolve with the needs of every generation," Koh said. 'Kyosei' - harmoniously living and working together with all people regardless of race, religion or culture - is Canon's corporate philosophy which reflects that as a corporate citizen, balancing the harmony between corporate social responsibility and business interests that is essential to help sustain the prosperity for generations to come. Nurturing life, just as the Canon brand was nurtured by Malaysians for three decades, the company also extended today's invitation to its employees' family members to experience working with nature and being harmonious with the environment. The 'One Canon One Tree' programme today was graced by the Mayor of Shah Alam, Yang Bahagia Dato' Haji Ahmad Zaharin bin Mohd Saad, and involved the participation of around 600 participants, including 450 Canon employees, business partners and family members, 100 mosque parishs and nearby residents, as well as volunteers and MBSA employees. 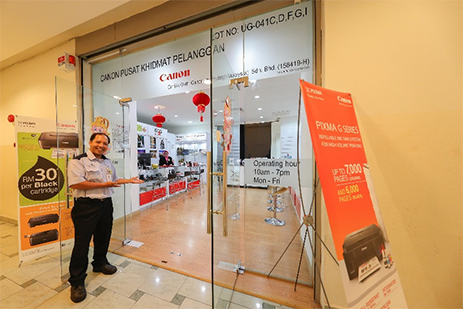 Canon Marketing (Malaysia) also contributed RM30,000 to MBSA. Three thousand saplings were planted surrounding the vicinity and amongst the seedlings which were planted included shrubs such as Jastica, Trulia, Dracena, Ligostremia, and fruit trees such as Frangipani, Quinine, Cempaka and Melinjau. Norbaiti binti Tamri, who has worked in Canon for 28 years, expressed that this is a great community initiative for her and her family. "It is important to educate on what a carbon footprint is, and why is it important to minimize it the best we can. Tree planting is a way to offset it to become carbon neutral, and as a Canon employee, I'm proud to be able to participate in this meaningful activity together with my children today to educate them on the importance of environment conservation," she said. Yg. Bhg. Dato’ Haji Zaharin bin Mohd Saad, Mayor of Shah Alam (left) and Andrew Koh, CEO and President, Canon Marketing Malaysia (2nd from left) and Canon VIPs plant a tree together.